I haven't been blogging much lately because, well...I moved. I closed on the house I bought 2 weeks sooner than I thought I would, so just like 3 months ago, I had to pack up everything I own and move in about 5 days. Not fun. I know you should never say never, but I never want to move again. Or at least not anytime soon. I figured it out...in the past 3 years, I've moved 5 times. 5 times! I could say so much about that, but the only thing I think I need to say is that I love my new house and hope to live in it for as long as I can. Especially because I have no plans to move in with anyone in their house again in this lifetime. The house I purchased is great. Roomy. Lots of storage space. And a really well designed kitchen. With appliances from 1971. That's right, folks! They're avocado green! Since I really love to cook and bake I was a little bummed to be buying a house with such an outdated kitchen, but I figure this is a good excuse for me to save up my pennies and build my dream kitchen down the road. If it were updated, I'd be more likely to just live with whatever the house came with. But since my appliances are older than me, odds are, I'm going to have to start replacing things sometime soon. 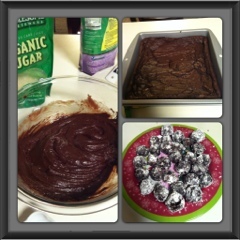 The other night, I decided to test out my stove and make some brownie bites from Chloe Coscarelli's cookbook, "Chloe's Kitchen: 125 Easy, Delicious Recipes for Making the Food You Love the Vegan Way." I'd share the recipe, but...Miss Chloe probably wouldn't like that. And I really think her cookbook is worth buying. I will say that this recipe was ridiculously easy. There were just a couple ingredients and I had almost everything I needed to make the brownie bites in my pantry already. (I normally would have had all of them...someone forgot to buy almond milk at the store last week!) In under an hour, I was able to whip up brownies from scratch (something I'd never done before) and turn them into tasty little bites. (or as I liked to call them, balls) I took them to a party my running club had last night and they were a hit - with the vegans and the non vegans! I'm looking forward to trying out more recipes in this cookbook. There are some "old favorites" like spinach artichoke dip, broccoli soup, and macaroni and cheese, but there are also recipes for things like moo shoo vegetables with homemade Chinese pancakes. I think there's a good mix of classics that vegans and non vegans would like plus some more exotic dishes that your meat and potatoes friends might not enjoy as much. As an added bonus, Chloe offers options for making many of the recipes vegan AND gluten free.﻿ If you're looking for a last minute gift for the vegan or vegetarian in your life, I'd definitely consider picking up this cookbook.